Good News! 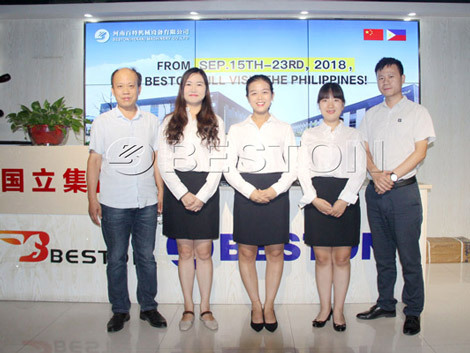 We Beston Machinery will visit the Philippines from September 15 to September 23, 2018. It will be the third time that we visit the Philippines. Our sales team and engineer team will fly to the Philippines to visit our customers together this time. Therefore, if you have any questions about waste pyrolysis machine, waste sorting machine, biomass charcoal making machine and egg tray machine. Contact us in advance. You will get professional reply from our professional team face to face. Waste Pyrolysis Machine: it is a kind of pyrolysis equipment that can dispose of waste plastic, waste tire, medical waste, oil sludge. We can get fuel oil, carbon black, steel wire from these raw materials through using waste pyrolysis machine. The models of the machines are: BLJ-6, BLJ-10, BLL-16, BLL-30. Municipal Solid Waste Sorting Plant: we can use the equipment to get organic, plastics, metal, brick, stone, etc. From the garbage with high efficiency. The models of the waste sorting machines are: BFX-100, BFX-200, BFX-300, BFX-400. 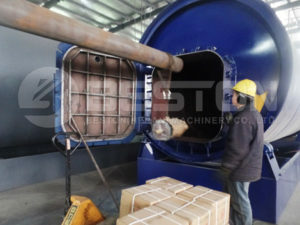 Biomass Charcoal Making Machine: it is mainly used to process the wood, coconut shell, palm kernel shell, rice husk, straw, sawdust, sugarcane bagasse, etc into bio-char. The models of the machines are: BST-03, BST-05, BST-12, BST-20, BST-30. Paper Egg Tray Machine: with the machine, we can turn waste paper into paper egg trays to pack eggs. It can make 1000pcs, 1500, 2000pcs, 3000-5000pcs, 5000-7000pcs egg trays per hour. The above are our main products. If you need, you can choose an appropriate one. We are sincerely appreciated to meet you at the Philippines. Thanks in advance!